A poll this past summer by SERMO, a global social network exclusively for physicians, found only 10% of doctors reporting that patients “frequently” arrive at an accurate diagnosis after researching their condition online. In other words, lots of misdiagnoses on the part of patients before they even enter the exam room. That disconnect is a challenge for physicians. But often what patients and their loved ones hear is not what the doctor is intending them to hear. Bandman explains that to many patients, doctors are speaking a foreign language. As a result, patients often leave the office after receiving a diagnosis, or a treatment plan, that they don’t fully understand. “That doesn’t serve the doctor well,” Bandman says. “And it doesn’t serve patients well because they walk away, more often than not, confused. The Center for Communication in Medicine has been working to bridge that communication gap. The Center’s SpeakSooner initiative, and Difficult Conversations Toolkit, which includes a video and workbook, was developed to help educate and prepare patients to identify their questions, concerns, and be able to make informed decisions. “That takes the mind reading out of the equation for doctors and invites open and honest communication,” Bandman says. The Toolkit takes what other patients have experienced beforehand and allows others to think about it, identify what they’re concerns are. 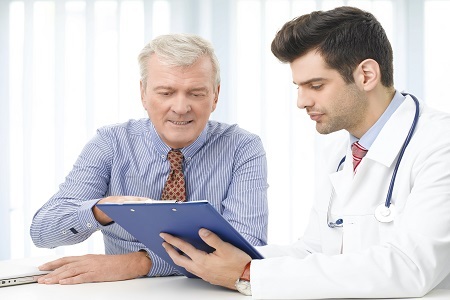 So when they walk through the door, not only is it helpful in terms of the patients feeling like they’re clear about some of the questions they’d like to ask, it also helps the physician understand what the patient is ready to hear. “It really takes that pressure off,” Bandman says. How much information is too much information? Bandman says that some patients want to know more, while some want to know less. “And who’s going to let the doctor know that other than the patients themselves?” Bandman asks, rhetorically. Does that mean that physicians sometimes don’t give patients enough credit for already knowing, or being ready to hear the truth? Bandman says that some health-related information on the Web can be “absolutely dangerous,” or at the very least, misleading. “We hope we’re guiding them in a constructive direction,” he says. Bandman says that in the ideal scenario, physicians invite their patients to use the Toolkit. The Center also offers community education programs across Vermont that focus on the SpeakSooner principles. The message to patients is that it's up to them to sit down with their doctors and open up these conversations. Bandman says the result of SpeakSooner principles is a much more efficient and effective use of the time physicians and patients spend together. That shows up in office visits with greater efficiencies.